Have you ever wondered what the world’s smallest touch phone looks like? There was a time when smartphones were very rare and were being used only for few purposes, but today phones have become the necessity of life. <oreover, people are confused about the future but the best way to predict future is to design it. As technology develops, things get smaller and portable so as to do this, there are companies trying to make devices smaller than ever. 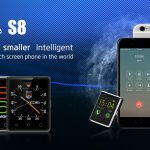 As a consequence, one of the Chinese company has launched the world’s smallest touch phone – the Vphone S8. The smartly designed Vphone S8 contains a TF card slot and a magnetic connector for charger followed by speaker below. On the opposite side, there are noise cancellation and a standard microphone. In addition to it, there is a mini USB port at the lower end. The unlock button in the smallest touch phone is placed on the right side. It has got two options regarding color black and silver. Vphone s8 left behind the previous smallest touchscreen phone which was of the 2.45-inch display. The Vphone S8 features contains 1.54-inch TFT touchscreen, protected with 2.5D curved glass. An aluminum-magnesium alloy covers the housing of the phone.The Vphone S8 comes at dimensions of 46.7 mm x 37.3 mm x 9.9 mm and weighs only 30 grams. There are many features of Vphone S8 that may surprise you, for instance, it’s health housekeeping apps like pedometer and heart rate measurement. You can use the pedometer app for physical fitness and sports activities. in addition to it, it’s having a built-in motion chip which helps in recording the consumption of each calorie.